In the late 1980s poet and translator Stephen Watts composed a series of numbered notes on his typewriter, bringing together two places where he spent time: London’s Isle of Dogs and the Hebrides. The typed pages went missing and were forgotten. 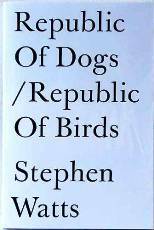 In 2012 they turned up and now, following light editing, Test Centre has published them with the title Republic Of Dogs/ Republic Of Birds. Watts is a poet and translator with a wide international reputation. He has worked as a poet in hospitals, schools and centres for homeless people with a particular interest in how language divides and unites us. In 2014 Enitharmon published his collection Ancient Sunlight following several pamphlets and collections, some bi-lingual. How much these docks had been changed. In less than five years. When they were closed down you could hardly get inside at all. Now they had been metamorphosed, not as rocks are but as money does.